We are please to announce that ioby has launched our first fundraising project, PHASE 1, which you can read about (and donate to) at https://ioby.org/project/java-st-garden-collaborative-phase-1. ioby is an organization that connects change with resources. They saw a movement brewing, a movement toward people taking back their environment, creating renewed and revitalized areas of their own neighborhoods, doing it all on their own, and out of their own pockets. These were labors of love, no doubt, and happening in pockets here and there but with no cohesion. This is a movement after all and the dots needed to be connected. A platform needed to be created. Enter ioby.org. ioby was founded in 2008 by Cassie Flynn, Brandon Whitney and Erin Barnes, and as Erin says, “We know people care about the environment, but their most prominent option is to purchase something. Buying a table or a new light bulb leaves a lot of people thinking, ‘Now what?’ They are hungry to get their hands dirty." Having studied water conservation, climate change and community resources at the Yale School of Forestry & Environmental Studies, the three friends knew that the face of change could be powerful and actionable, meaningful and, most importantly, local. ioby.org enables all of us to invest in change—then see (and live with) the return on our investment. There are no celebrities, no large-scale protests. There are everyday neighbors taking small steps—bringing sunlight, open space, fresh food and greenery into our backyards. As soon as Paula Segal at 596acres.org heard about our budding project, she alerted Helen Ho, Neighborhood Outreach and Project Support Manager from ioby, who immediately contacted Stella Goodall, our organizer and founder, to assist us with creating the necessary fundraising efforts to get us started. And so, we bring you PHASE 1 of our community garden project. Funds for PHASE 1 will enable us to break ground, giving us the tools to do so literally and to begin our first project of planting materials that will have an environmentally remediatory (is that a word?) effect on the soil quality of our site. We will monitor improvements, and our space will not only develop into and serve as a beautiful green space to be enjoyed by all but also as an educational environment as we post storyboards throughout the site with our progress on this and all our endeavors. If you are inspired by what we are up to, please also share this project with people you know who would like to make a difference in our communities by becoming a contributor to the Java St Garden Collaborative. 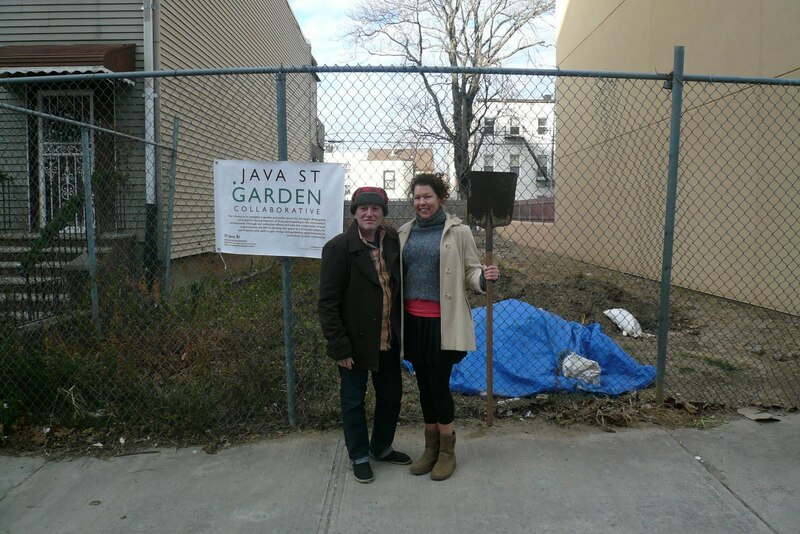 At our most recent meeting, we were joined by Paula Segal of 596 Acres whose organization has enabled at least one group so far to go ahead with their community garden project: 426 Halsey Community Garden. Organizer Shatia Jackson says "We have had two weekends of working on the garden thus far. and I can't believe how far we have gotten! We completed our compost station which has 4 bins, raked up all the dead leaves to use for compost, got rid of about 15 bags of garbage and pruned all the trees to optimize sunlight. The volunteer turnout was amazing: at our peak we had at least 20 people helping out. The community's interest is overwhelming! For anyone who would like to help out, we will have our gates open every weekend as long as weather permits. " 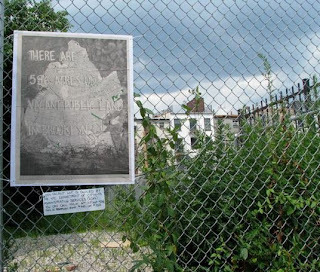 596 Acres is a public education project aimed at making communities aware of the land resources around them. With the goal of a food sovereign New York City in mind, 596 Acres is helping neighbors form connections to the vacant lots in their lives -- from the smallest (throwing a seed bomb) to the largest (hosting a public meeting with the head of a City Agency that owns a vacant lot that was promised to the community as a park, see myrtlepark.org). Thanks to the Center for the Study of Brooklyn, we have learned that many of these lots are actually publicly owned and are developing a platform for negotiating interim and long term community uses for this warehoused public space. 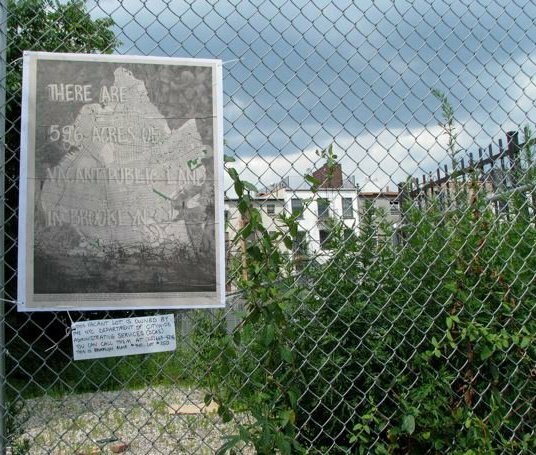 596 acres is how much vacant public land existed in Brooklyn alone as of April 2010. If even a small portion of that was committed to neighborhood food production, we would have an abundance of fresh seasonal vegetables to eat! And think of all the grassy parks we could have! And composting sites! And whatever else Brooklynites and their neighbors know they need. Contextual information provided by the Center for the Study of Brooklyn.